The Ahemmusa Camp was an Ashlander settlement that had been set up in Vvardenfell by the Ahemmusa tribe at various points throughout history. In 2E 583, it was located southwest of Balmora in the Bitter Coast, and in 3E 427 it was located directly north of Vos on the north coast of the Grazelands. It was a point of relative stability for the Ahemmusa Ashlanders. The camp was the location of the Healer, Wise Woman, and other tribal dignitaries. Members of the tribe claimed the entire northern section of the Grazelands as their hunting and herding territory. Ald'ruhn's Under-Skar has always the main focal point for the town. 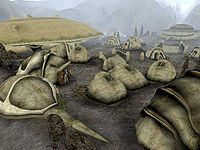 The settlement of Ald'ruhn (sometimes spelled Ald-ruhn), or Old Home in the Aldmeri Language, was originally a sacred Ashlander meeting ground, built around an ancient Emperor Crab shell known as Skar. The giant crab was defeated by the early Ashlander tribes of ancient past. The city of Ald'ruhn had its name loaned to the village of Old Run, a butchered Tamrielic version of the original name and translation. During the First and Second Eras, Ashlanders would embark upon an annual pilgrimage to Skar and pay tribute to their ancestors and how they united to kill the beast. They celebrated their victory and brought offerings to the cairns of the First Ashkhans—the founders of the four great tribes: Ahemmusa, Erabenimsun, Zainab and Urshilaku. Around 2E 583 the Redoran noble Drelyth Hleran discovered that his family had a deep connection to Ald'ruhn, as his ancestor was the one who dealt the killing blow to Skar. After finding out the truth about his ancestor, and earning the respect of the Ashlander tribes, Drelyth Hleran promised to allow them to continue practicing their culture there in peace. During the Imperial Simulacrum in the late Third Era, the village of Old Run was an active settlement, being ruled by Lord Nisik. It had a rivalry with Darnim Watch. The promise was clearly not kept by Drelyth's descendants, however, as by 3E 427, Ald'ruhn had become the seat of House Redoran's council, and all of the councilors had expansive mansions in Under-Skar, the manor district built in the hollowed shell of Skar. There were many smaller houses clustered about the giant shell, including both the Fighters Guild and Mages Guild. Representatives of the Thieves Guild were to be found in "The Rat In The Pot" inn, and on the east side of town was a large Tribunal Temple. The Morag Tong guildhall was located in a mansion in Under-Skar. Close to the south was the Imperial Legion fort, Buckmoth Legion Fort. 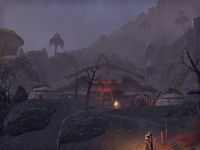 Alten Meerhleel (also called Alten Meirhall) is a port-town situated in the outer marsh of the region of Murkmire, within the province of Black Marsh. Alten Meerhleel serves as a trading post between the city of Lilmoth and deeper Murkmire, around Dead-Water Village. Alten Meerhleel was constructed by Harbormaster Akhur sometime in the Second Era, hoping it would become an equivalent to Lilmoth in the southeast. By the Imperial Simulacrum in the late Third Era, Alten Meirhall was an active settlement, being ruled by Lady Judiana. It had a rivalry with Longmont. This page was last modified on 20 December 2018, at 02:20.